First time feature film director Laure de Clermont-Tonnerre is taking the same route as Chloé Zhao did last year with The Rider. She takes us into an unusual location for a modern day western, behind the bars of a prison cell. Produced by Robert Redford, The Mustang revives the notion of rehabilitation through animals, specifically a horse. Redford’s 1998 unsung masterpiece The Horse Whisperer did the same, in a more traditional cinematic manner. The Mustang is specific and narrowly focused on inmates who train wild mustangs, who are then sold at auction to raise money for the prison work program. Bulgarian actor Matthias Schoenaerts (Red Sparrow, Bullhead) is a unique casting choice, allowing the actor to step out of typecast supporting roles and into something far more challenging and emotional. The Bureau of Land Management runs a program in a handful of western states, capturing wild roaming mustangs, for the purpose of allowing incarcerated violent criminals train the animals for their own mental health. 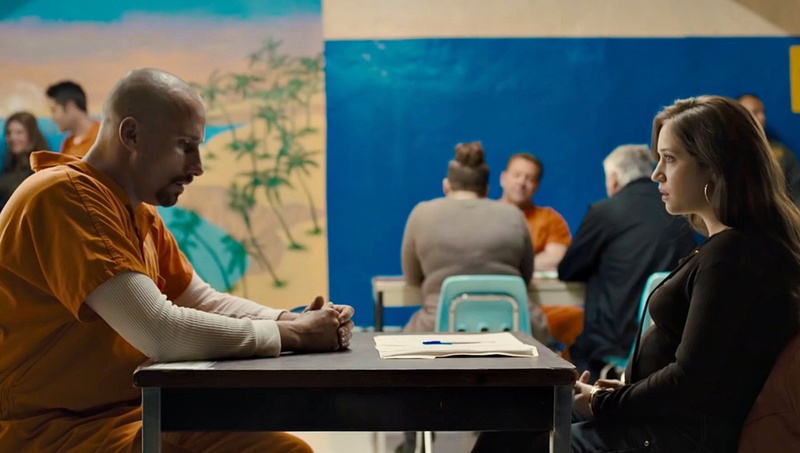 Roman Coleman (Schoenaerts) is one of those inmates, withdrawn from the general population, often times in solitary confinement, he has little to say to the prison psychologist (Britton) or anyone else. Apprehensive about working with horses, Coleman does enjoy the hours of outdoor time the program provides. His curiosity is peaked with one of the most violent horses in the pen, Myles (Dern) the director of the program matches the two. Henry (Mitchell), one of the most successful horse trainers, works with Coleman to get the feel of working with a wild animal. As one beast begins to settle down, the other takes a small step toward forgiveness. A slow burn film, The Mustang doesn’t fully sink in until you grasp the meaning of those final moments on screen. Usually when a successful short film is adapted into a feature, the same story is just expanded on, i.e. Whiplash. Clermont-Tonnerre has completely rebuilt her story from the 2014 short Rabbit, about a woman in a correctional facility learning to handle small animals. The Mustang sheds light on a program I bet most audience never knew existed. A slow burn film, The Mustang doesn’t fully sink in until you grasp the meaning of those final moments on screen. Her script is a brilliant case study for someone so withdrawn from their situation, almost catatonic in their state of living. Schoenaerts delicate performance allows the audience contempt and outrage for his character while slowly infusing those feelings with empathy for his complicated situation. His achievement in the art of body language, might hold up as one of the years most calculated and nuanced performances. Clermont-Tonnerre and co-writer Brock Norman Brock (Bronson) have a lot to say about the prison system, doing so in a way that’s both unbiased and informative. A few of the plot points are obvious and foreseeable but that has little effect on the message behind movie. Jed Kurzel’s original score is quite effective, despite being used so sparsely. The cinematography in The Mustang might not be the beautiful sweeping open plans you expect in a traditional westerns, as most of the western landscape is seen from a distances, framed in prison bars. Both Clermont-Tonnerre’s and Zhao have constructed films that look at men who are confined by their own choices and liberated by their acute surroundings. Schoenaerts performance is worth your attention in a story you have seen and heard before, but from a point of view that’s entirely original.